Broadsound Shire, an area of 18,307 sq km, generally 180 km north-west of Rockhampton, was amalgamated with Belyando and Nebo shires in 2008 to form Isaac Regional Council. The administrative centre, St Lawrence, was near the shire's southern coastal boundary. The northern boundary was near Sarina, and inland the shire adjoined Peak Downs and Belyando Shires. Until the 1970s the shire's economy was predominantly cattle grazing. After then three coal mines and two dormitory towns were established. The towns, Dysart and Middlemount, constituted 72% of the shire's population in 2001. The shire was named after the stretch of water or bay, east of St Lawrence, into which the Styx River empties. It was named by Lieutenant James Cook in 1770. In about 1859 an enterprising James Macartnay took up a grazing run west of St Lawrence which served quite early as a port. In the 1860s it was a place of entry for communication and supplies to Clermont and Peak Downs mines. 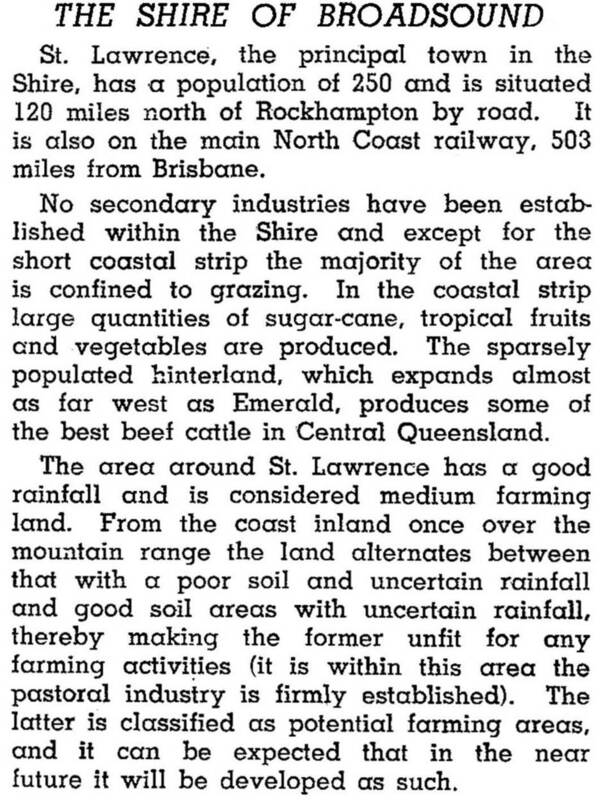 St Lawrence was soon overshadowed by Rockhampton, and languished for want of a coastal railway connection; a through railway line from Rockhampton to Sarina did not come until 1921, and St Lawrence was the last link in the chain. By 1876 the Broadsound district reputedly had over 100,000 sheep and 40,000 cattle (Bailliere's guide). In 1879 the Broadsound local government division was formed, with Macartnay as its first chair. (His life is summarised in E.J. Brady's Australia Unlimited, 1918). After World War II several of the shire's main roads were improved, and the inland north-south route was sealed in the 1960s. Brigalow country west of the range was cleared for cattle grazing. In the 1970s the Utah conglomerate started the Saraji open cut coal mine (130 km west of St Lawrence), and the Dysart mining town 25 km south of the mine was begun in 1973. Another mining town, Middlemount (100 km south-west of St Lawrence) services the German Creek and Norwich Park coal mines. A coastal (non-coal) town, Carmila, is 50 km north of St Lawrence. It was originally called Scrubby Creek, and was known locally for its botanical diversity rather than 'scrubbiness'. Agricultural clearing has removed the rich flora and substituted tobacco and sugar cane.